Eeeeek!!! Do you hear the screams coming from the STUDIO? Don't worry, we are just getting excited for Halloween. Or perhaps we're screaming because we ran out of chocolate... haha! 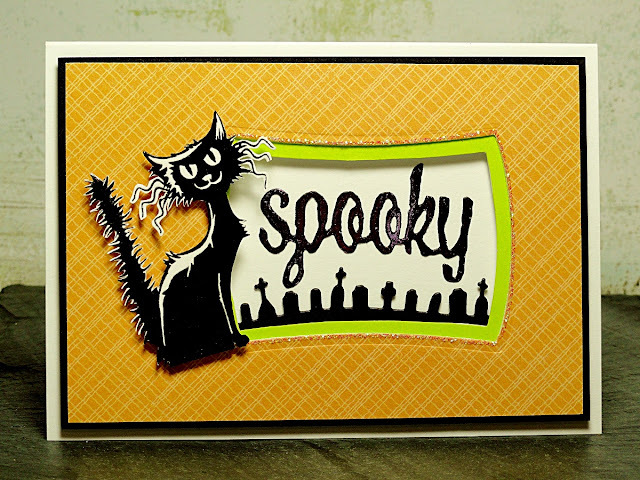 Join us this month as we share projects with a spooktacular theme. Black cats can't be spooky when they're this happy! For this design, a dimensional window was created using Spellbinder's Reverse Wonky Rectangles, lime green cardstock, black cardstock and patterned paper from Golden Moment. After the framing was completed, a portion of the die cut Dark City in black cardstock was attached along the inside bottom part of the window and on the outside portion of the patterned frame a thin line of Crystal Stickles. The entire piece was attached to a white card base with Scotch Foam Mounting Tape. The happy cat is from Spooky Fun which was stamped on white cardstock in Onyx Black VersaFine, heat embossed with clear powder and fussy cut. 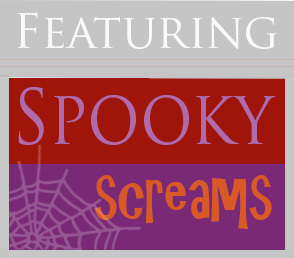 And for some spook-tacular shine, amethyst watercolor Deco Foil by Therm-O-Web was added to the top of the "spooky" die cut from the Halloween Creatures set.